The origins of toasting can be traced back to ancient societies in the form of raising their cup as a drink offering to their god(s), but there’s also evidence that the ancient Greeks drank to eachother’s health which can be seen in The Odyssey when Ulysses raises a glass to Achilles. Toasting at weddings then, dates as far back as the sixth Century B.C. When there was a gathering, the Greeks would pour the wine from a common pitcher. The host (the bride’s father) would drink from his glass first to prove to his guests that there was no poison placed into the wine. In these fraught times, the Greeks would spike the drinks of their enemies to ensure silence and even use to prevent a messy divorce! The warring neighbours often ended in a truce that brought the leaders’ children together in marriage. And a banquet celebration. And this is where the tradition of the wedding toast began. The actual term “toast” comes from the Roman practice of dropping a piece of burnt bread into the wine. This was done to temper some of the bad wines the Romans sometimes had to drink. Over the next centuries the term toasting gradually incorporated the honouring of people. The person being honoured often received the piece of toast. Not only was this an honour, it was also used to make the bread edible and also soak up the acidity of the wine. By the 17th and 18th centuries the practice was so popular that Toastmasters were employed to ensure that the toasting didn’t become too excessive! Hold the glass in the right hand and extend it straight out from the right shoulder. This is a gesture done to show that you come in friendship and peace. 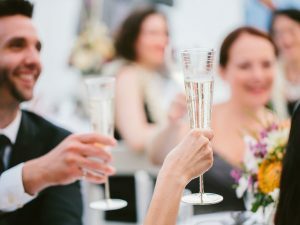 The toast should always end with an indication to all guests to repeat the last line of the toast. For an example, “Please join me in wishing the happy new couple many wonderful years to come, To the bride and groom.” At that point, the first sip of wine should be taken.